Have you ever received a cactus as a gift only to watch it die a slow death over a period of months? I have. Despite a place near a sunny window and regular watering, the seemingly cast-iron plant did not survive. How do these plants flourish in the desert where no one takes care of them? Cacti are well adapted for a desert climate. They survive long periods of time with no water, yet do not drown in the torrential rains common to the desert. The key to their survival is their root system, which is shallow but spreads out a great distance from the center of the plant. The type of cactus most commonly grown indoors has a thick green stem covered with spines. Since plants lose water through their leaves, the absence of leaves on a cactus helps it retain water in its stem. The key to keeping a cactus alive indoors is to regulate its water. Most cacti die indoors because they are watered too much. It is important that the cactus be planted in a container with a drain hole. The potting medium should be a mix of sand, pumice and organic material that drains quickly. 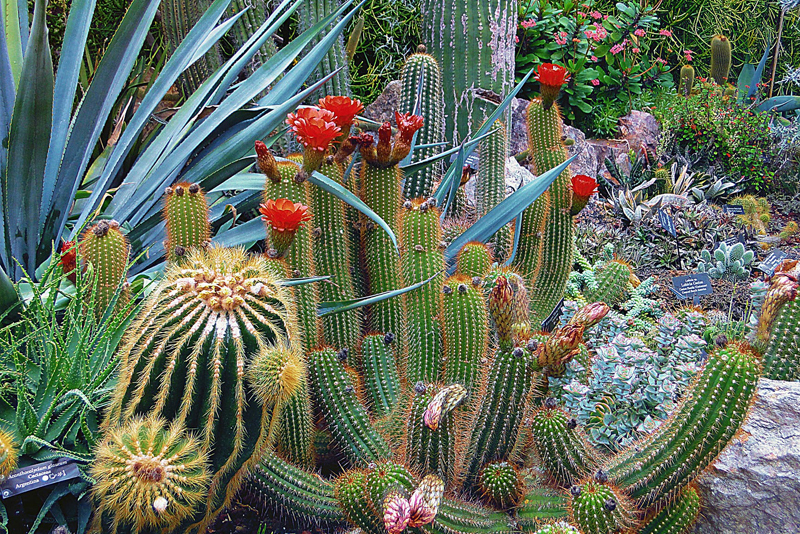 Most nurseries and home improvement stores sell mixes specifically designed for cacti and succulents. Some people try to grow cacti in a closed container, placing gravel at the bottom for water to drain into. The problem with this approach is that the difference in the size of the particles causes water to perch right above the gravel, which makes the soil just above the gravel soggy. Cactus roots do not like soggy soil. I have on my kitchen counter a columnar cactus (Pilosocereus pachycladus) that was given to me by one of my former first grade students. He is in college now and the cactus has survived. The variety is one of the easiest to grow and is available worldwide. It is watered weekly and the water drains quickly out of the bottom of the ceramic container. One simple gadget that can keep you from watering your cactus too much is a moisture meter. It is usually housed in a plastic box atop a long metal probe. When you stick the probe into the soil, the meter will indicate whether the soil is dry, moist or wet. The model I have has a needle that goes across a dial with the numbers one through ten, so I can see if my plant needs water. Insert the probe carefully, along the side of the pot so as not to disturb the roots. Water only when dry. With the right container, potting mix and just a bit of water, you can grow a cactus indoors.